Would you spend $1,000 to save $100,000? Many of the considerations listed here may be immeasurable, however each has an immense impact on your business. This ROI Calculator is designed to help you determine the savings between inspection techniques – the glue/tape method or outdated 1-piece grid plates versus the introduction of Inspection Arsenal® modular, quick-swap Loc-N-Load™ fixtures. Now that you’ve calculated the savings between outdated techniques and Inspection Arsenal® Loc-N-Load™ techniques, give some thought to the following, harder to measure costs. Value of labor when less skilled employees can inspect, reduced learning curve. Annual cost of quality overall. 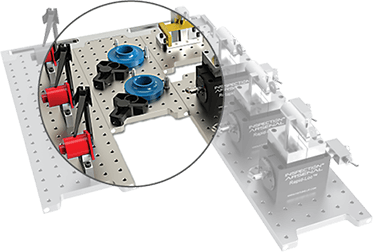 "As part of its lean focus, Kennebec made this fixture system the standard, thereby reducing fixture and training costs and allowing production personnel to inspect parts. In order of priority, CMM programmers have designed 10 dedicated Loc-N-Load™ fixtures for some of their most complex parts. Bump roughly calculated a savings of nearly $40,000 in 2014 for the first seven of the 10 parts converted to Loc-N-Load™ plates. "We are saving several minutes of inspection time each on these 5,500 pieces, which require 100% inspection. At our shop rate, the plate is paid for in little more than an hour." "The initial product launch of the implant consists of 3,120 complex parts requiring 100% inspection. Previously, the time to inspect was nearly one hour per piece. The new, leaner process now takes just 35 minutes. If a $100 an hour rate is used, the savings in the inspection cycle time alone for this part equates to roughly $40 per piece or a savings of approximately $125,000. "Much greater savings being realized, but not calculated, are the savings in setup time and the reduction of expensive spindle downtime on the shop floor. This one project, once approved, will require the inspection of thousands more pieces and is just one of the hundreds of parts manufactured by Triangle that will now become a great deal more profitable." 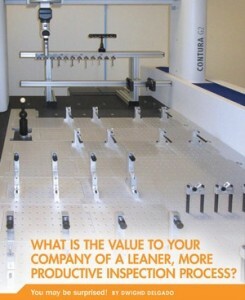 "We are constantly shuffling between CMM training classes, customer demos, and turnkey inspections. The quick-swap features of Loc-N-Load™ and Open-Sight™ fixture systems from Inspection Arsenal™ make moving between these setups quite simple and efficient. "Reducing the time it takes to build and break down inspection setups and faster recalibration means more time can be spent teaching about equipment features and programming techniques." "The housing parts were previously measured in batches of two, with measurement taking approximately 40 minutes each. Using this new method, each part is measured in 11.25 minutes and the CMM can inspect eight parts in one setup. Using a conservative $100 per hour quality control rate, this yields a savings of $384 per batch. Because this eight-part inspection job repeats 10 times per year, the annual savings for this three-part family is $11,523."